Gregorian chant is the central tradition of Western plainchant, a form of monophonic, unaccompanied sacred song of the Roman Catholic Church. Gregorian chant developed mainly in western and central Europe during the 9th and 10th centuries, with later additions and redactions. Although popular legend credits Pope Gregory I with inventing Gregorian chant, scholars believe that it arose from a later Carolingian synthesis of Roman chant and Gallican chant. Gregorian chants were organized initially into four, then eight, and finally 12 modes. Typical melodic features include a characteristic ambitus, and also characteristic intervallic patterns relative to a referential mode final, incipits and cadences, the use of reciting tones at a particular distance from the final, around which the other notes of the melody revolve, and a vocabulary of musical motifs woven together through a process called centonization to create families of related chants. The scale patterns are organized against a background pattern formed of conjunct and disjunct tetrachords, producing a larger pitch system called the gamut. The chants can be sung by using six-note patterns called hexachords. Gregorian melodies are traditionally written using neumes, an early form of musical notation from which the modern four-line and five-line staff developed. Multi-voice elaborations of Gregorian chant, known as organum, were an early stage in the development of Western polyphony. Gregorian chant was traditionally sung by choirs of men and boys in churches, or by men and women of religious orders in their chapels. It is the music of the Roman Rite, performed in the Mass and the monastic Office. Although Gregorian chant supplanted or marginalized the other indigenous plainchant traditions of the Christian West to become the official music of the Christian liturgy, Ambrosian chant still continues in use in Milan, and there are musicologists exploring both that and the Mozarabic chant of Christian Spain. Although Gregorian chant is no longer obligatory, the Roman Catholic Church still officially considers it the music most suitable for worship. During the 20th century, Gregorian chant underwent a musicological and popular resurgence. Singing has been part of the Christian liturgy since the earliest days of the Church. Until the mid-1990s, it was widely accepted that the psalmody of ancient Jewish worship significantly influenced and contributed to early Christian ritual and chant. This view is no longer generally accepted by scholars, due to analysis that shows that most early Christian hymns did not have Psalms for texts, and that the Psalms were not sung in synagogues for centuries after the Destruction of the Second Temple in AD 70. However, early Christian rites did incorporate elements of Jewish worship that survived in later chant tradition. Canonical hours have their roots in Jewish prayer hours. "Amen" and "alleluia" come from Hebrew, and the threefold "sanctus" derives from the threefold "kadosh" of the Kedushah. The New Testament mentions singing hymns during the Last Supper: "When they had sung the hymn, they went out to the Mount of Olives" (Matthew 26.30). Other ancient witnesses such as Pope Clement I, Tertullian, St. Athanasius, and Egeria confirm the practice, although in poetic or obscure ways that shed little light on how music sounded during this period. The 3rd-century Greek "Oxyrhynchus hymn" survived with musical notation, but the connection between this hymn and the plainchant tradition is uncertain. Musical elements that would later be used in the Roman Rite began to appear in the 3rd century. The Apostolic Tradition, attributed to the theologian Hippolytus, attests the singing of Hallel psalms with Alleluia as the refrain in early Christian agape feasts. Chants of the Office, sung during the canonical hours, have their roots in the early 4th century, when desert monks following St. Anthony introduced the practice of continuous psalmody, singing the complete cycle of 150 psalms each week. Around 375, antiphonal psalmody became popular in the Christian East; in 386, St. Ambrose introduced this practice to the West. In the fifth century, a singing school, the Schola Cantorum, was founded at Rome to provide training in church musicianship. Scholars are still debating how plainchant developed during the 5th through the 9th centuries, as information from this period is scarce. Around 410, St. Augustine described the responsorial singing of a Gradual psalm at Mass. At c. 520, Benedict of Nursia established what is called the rule of St. Benedict, in which the protocol of the Divine Office for monastic use was laid down. Around 678, Roman chant was taught at York. Distinctive regional traditions of Western plainchant arose during this period, notably in the British Isles (Celtic chant), Spain (Mozarabic), Gaul (Gallican), and Italy (Old Roman, Ambrosian and Beneventan). These traditions may have evolved from a hypothetical year-round repertory of 5th-century plainchant after the western Roman Empire collapsed. 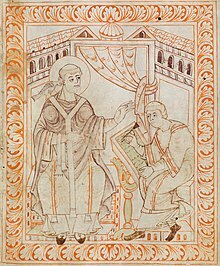 John the Deacon, biographer (c. 872) of Pope Gregory I, modestly claimed that the saint "compiled a patchwork antiphonary", unsurprisingly, given his considerable work with liturgical development. He reorganized the Schola Cantorum and established a more uniform standard in church services, gathering chants from among the regional traditions as widely as he could manage. Of those, he retained what he could, revised where necessary, and assigned particular chants to the various services. According to Donald Jay Grout, his goal was to organize the bodies of chants from diverse traditions into a uniform and orderly whole for use by the entire western region of the Church. His renowned love for music was recorded only 34 years after his death; the epitaph of Honorius testified that comparison to Gregory was already considered the highest praise for a music-loving pope. While later legends magnified his real achievements, these significant steps may account for why his name came to be attached to Gregorian chant. The Gregorian repertory was further systematized for use in the Roman Rite, and scholars weigh the relative influences of Roman and Carolingian practices upon the development of plainchant. The late 8th century saw a steadily increasing influence of the Carolingian monarchs over the popes. During a visit to Gaul in 752–753, Pope Stephen II celebrated Mass using Roman chant. According to Charlemagne, his father Pepin abolished the local Gallican Rites in favor of the Roman use, in order to strengthen ties with Rome. Thirty years later (785–786), at Charlemagne's request, Pope Adrian I sent a papal sacramentary with Roman chants to the Carolingian court. According to James McKinnon, over a brief period in the 8th century, a project overseen by Chrodegang of Metz in the favorable atmosphere of the Carolingian monarchs, also compiled the core liturgy of the Roman Mass and promoted its use in Francia and throughout Gaul. Willi Apel and Robert Snow assert a scholarly consensus that Gregorian chant developed around 750 from a synthesis of Roman and Gallican chants, and was commissioned by the Carolingian rulers in France. Andreas Pfisterer and Peter Jeffery have shown that older melodic essentials from Roman chant are clear in the synthesized chant repertory. There were other developments as well. Chants were modified, influenced by local styles and Gallican chant, and fitted into the theory of the ancient Greek octoechos system of modes in a manner that created what later came to be known as the western system of the eight church modes. The Metz project also invented an innovative musical notation, using freeform neumes to show the shape of a remembered melody. This notation was further developed over time, culminating in the introduction of staff lines (attributed to Guido d'Arezzo) in the early 11th century, what we know today as plainchant notation. The whole body of Frankish-Roman Carolingian chant, augmented with new chants to complete the liturgical year, coalesced into a single body of chant that was called "Gregorian." The changes made in the new system of chants were so significant that they have led some scholars to speculate that it was named in honor of the contemporary Pope Gregory II. Nevertheless, the lore surrounding Pope Gregory I was sufficient to culminate in his portrayal as the actual author of Gregorian Chant. He was often depicted as receiving the dictation of plainchant from a dove representing the Holy Spirit, thus giving Gregorian chant the stamp of being divinely inspired. Scholars agree that the melodic content of much Gregorian Chant did not exist in that form in Gregory I's day. In addition, it is known definitively that the familiar neumatic system for notating plainchant had not been established in his time. Nevertheless, Gregory's authorship is popularly accepted by some as fact to this day. Gregorian chant appeared in a remarkably uniform state across Europe within a short time. Charlemagne, once elevated to Holy Roman Emperor, aggressively spread Gregorian chant throughout his empire to consolidate religious and secular power, requiring the clergy to use the new repertory on pain of death. From English and German sources, Gregorian chant spread north to Scandinavia, Iceland and Finland. In 885, Pope Stephen V banned the Slavonic liturgy, leading to the ascendancy of Gregorian chant in Eastern Catholic lands including Poland, Moravia and Slovakia. Gregorian chant eventually replaced the local chant tradition of Rome itself, which is now known as Old Roman chant. In the 10th century, virtually no musical manuscripts were being notated in Italy. Instead, Roman Popes imported Gregorian chant from (German) Holy Roman Emperors during the 10th and 11th centuries. For example, the Credo was added to the Roman Rite at the behest of the Emperor Henry II in 1014. Reinforced by the legend of Pope Gregory, Gregorian chant was taken to be the authentic, original chant of Rome, a misconception that continues to this day. By the 12th and 13th centuries, Gregorian chant had supplanted or marginalized all the other Western plainchant traditions. This chant corresponds to the second one on the manuscript folio above beneath the large rubric Responsorium Graduale; by Schola Antiqua of Chicago. In the late 19th century, early liturgical and musical manuscripts were unearthed and edited. Earlier, Dom Prosper Guéranger revived the monastic tradition in Solesmes. Re-establishing the Divine Office was among his priorities, but no proper chantbooks existed. Many monks were sent out to libraries throughout Europe to find relevant Chant manuscripts. In 1871, however, the old Medicea edition was reprinted (Pustet, Regensburg) which Pope Pius IX declared the only official version. In their firm belief that they were on the right way, Solesmes increased its efforts. In 1889, after decades of research, the monks of Solesmes released the first book in a planned series, the Paléographie Musicale. The incentive of its publication was to demonstrate the corruption of the 'Medicea' by presenting photographed notations originating from a great variety of manuscripts of one single chant, which Solesmes called forth as witnesses to assert their own reforms. The monks of Solesmes brought in their heaviest artillery in this battle, as indeed the academically sound 'Paleo' was intended to be a war-tank, meant to abolish once and for all the corrupted Pustet edition. On the evidence of congruence throughout various manuscripts (which were duly published in facsimile editions with ample editorial introductions) Solesmes was able to work out a practical reconstruction. This reconstructed chant was academically praised, but rejected by Rome until 1903, when Pope Leo XIII died. His successor, Pope Pius X, promptly accepted the Solesmes chant – now compiled as the Liber Usualis – as authoritative. In 1904, the Vatican edition of the Solesmes chant was commissioned. Serious academic debates arose, primarily owing to stylistic liberties taken by the Solesmes editors to impose their controversial interpretation of rhythm. The Solesmes editions insert phrasing marks and note-lengthening episema and mora marks not found in the original sources. Conversely, they omit significative letters found in the original sources, which give instructions for rhythm and articulation such as speeding up or slowing down. These editorial practices have placed the historical authenticity of the Solesmes interpretation in doubt. Ever since restoration of Chant was taken up in Solesmes, there have been lengthy discussions of exactly what course was to be taken. Some favored a strict academic rigour and wanted to postpone publications, while others concentrated on practical matters and wanted to supplant the corrupted tradition as soon as possible. Roughly a century later, there still exists a breach between a strict musicological approach and the practical needs of church choirs. Thus the performance tradition officially promulgated since the onset of the Solesmes restoration is substantially at odds with musicological evidence. In his motu proprio Tra le sollecitudini, Pius X mandated the use of Gregorian chant, encouraging the faithful to sing the Ordinary of the Mass, although he reserved the singing of the Propers for males. While this custom is maintained in traditionalist Catholic communities (most of which allow all-female scholas as well, though), the Catholic Church no longer persists with this ban. Vatican II officially allowed worshipers to substitute other music, particularly sacred polyphony, in place of Gregorian chant, although it did reaffirm that Gregorian chant was still the official music of the Roman Rite of the Catholic Church, and the music most suitable for worship in the Roman Liturgy. Gregorian chant is, as 'chant' implies, vocal music. The text, the phrases, words and eventually the syllables, can be sung in various ways. The most straightforward is recitation on the same tone, which is called "syllabic" as each syllable is sung to a single tone. Likewise, simple chants are often syllabic throughout with only a few instances where two or more notes are sung on one syllable. "Neumatic" chants are more embellished and ligatures, a connected group of notes, written as a single compound neume, abound in the text. Melismatic chants are the most ornate chants in which elaborate melodies are sung on long sustained vowels as in the Alleluia, ranging from five or six notes per syllable to over sixty in the more prolix melismata. Certain classes of Gregorian chant have a separate musical formula for each mode, allowing one section of the chant to transition smoothly into the next section, such as the psalm verses that are sung between the repetition of antiphons, or the Gloria Patri. Thus we find models for the recitation of psalmverses, Alleluia and Gloria Patri for all eight modes. Not every Gregorian chant fits neatly into Guido's hexachords or into the system of eight modes. For example, there are chants — especially from German sources – whose neumes suggest a warbling of pitches between the notes E and F, outside the hexachord system, or in other words, employing a form of chromatism. Early Gregorian chant, like Ambrosian and Old Roman chant, whose melodies are most closely related to Gregorian, did not use the modal system. The great need for a system of organizing chants lies in the need to link antiphons with standard tones, as in for example, the psalmody at the Office. Using Psalm Tone i with an antiphon in Mode 1 makes for a smooth transition between the end of the antiphon and the intonation of the tone, and the ending of the tone can then be chosen to provide a smooth transition back to the antiphon. As the modal system gained acceptance, Gregorian chants were edited to conform to the modes, especially during 12th-century Cistercian reforms. Finals were altered, melodic ranges reduced, melismata trimmed, B-flats eliminated, and repeated words removed. Despite these attempts to impose modal consistency, some chants — notably Communions — defy simple modal assignment. For example, in four medieval manuscripts, the Communion Circuibo was transcribed using a different mode in each. The earliest notated sources of Gregorian chant (written ca. 950) used symbols called neumes (Gr. sign, of the hand) to indicate tone-movements and relative duration within each syllable. A sort of musical stenography that seems to focus on gestures and tone-movements but not the specific pitches of individual notes, nor the relative starting pitches of each neume. Given the fact that Chant was learned in an oral tradition in which the texts and melodies were sung from memory, this was obviously not necessary. The neumatic manuscripts display great sophistication and precision in notation and a wealth of graphic signs to indicate the musical gesture and proper pronunciation of the text. Scholars postulate that this practice may have been derived from cheironomic hand-gestures, the ekphonetic notation of Byzantine chant, punctuation marks, or diacritical accents. Later adaptations and innovations included the use of a dry-scratched line or an inked line or two lines, marked C or F showing the relative pitches between neumes. Consistent relative heightening first developed in the Aquitaine region, particularly at St. Martial de Limoges, in the first half of the eleventh century. 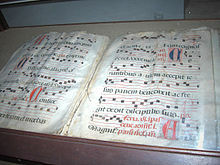 Many German-speaking areas, however, continued to use unpitched neumes into the twelfth century. Additional symbols developed, such as the custos, placed at the end of a system to show the next pitch. Other symbols indicated changes in articulation, duration, or tempo, such as a letter "t" to indicate a tenuto. Another form of early notation used a system of letters corresponding to different pitches, much as Shaker music is notated. By the 13th century, the neumes of Gregorian chant were usually written in square notation on a four-line staff with a clef, as in the Graduale Aboense pictured above. In square notation, small groups of ascending notes on a syllable are shown as stacked squares, read from bottom to top, while descending notes are written with diamonds read from left to right. When a syllable has a large number of notes, a series of smaller such groups of neumes are written in succession, read from left to right. The oriscus, quilisma, and liquescent neumes indicate special vocal treatments, that have been largely neglected due to uncertainty as to how to sing them. Since the 1970s, with the influential insights of Dom Eugène Cardine (see below under 'rhythm'), ornamental neumes have received more attention from both researchers and performers. B-flat is indicated by a "b-mollum" (Lat. soft), a rounded undercaste 'b' placed to the left of the entire neume in which the note occurs, as shown in the "Kyrie" to the right. When necessary, a "b-durum" (Lat. hard), written squarely, indicates B-natural and serves to cancel the b-mollum. This system of square notation is standard in modern chantbooks. Gregorian chant was originally used for singing the Office (by male and female religious) and for singing the parts of the Mass pertaining to the lay faithful (male and female), the celebrant (priest, always male) and the choir (composed of male ordained clergy, except in convents). Outside the larger cities, the number of available clergy dropped, and lay men started singing these parts. The choir was considered an official liturgical duty reserved to clergy, so women were not allowed to sing in the Schola Cantorum or other choirs except in convents where women were permitted to sing the Office and the parts of the Mass pertaining to the choir as a function of their consecrated life. For in these [Offertories and Communions] there are the most varied kinds of ascent, descent, repeat..., delight for the cognoscenti, difficulty for the beginners, and an admirable organization... that widely differs from other chants; they are not so much made according to the rules of music... but rather evince the authority and validity... of music. Given the oral teaching tradition of Gregorian chant, modern reconstruction of intended rhythm from the written notation of Gregorian chant has always been a source of debate among modern scholars. To complicate matters further, many ornamental neumes used in the earliest manuscripts pose difficulties on the interpretation of rhythm. Certain neumes such as the pressus, pes quassus, strophic neumes may indicate repeated notes, lengthening by repercussion, in some cases with added ornaments. By the 13th century, with the widespread use of square notation, most chant was sung with an approximately equal duration allotted to each note, although Jerome of Moravia cites exceptions in which certain notes, such as the final notes of a chant, are lengthened. While the standard repertory of Gregorian Chant was partly being supplanted with new forms of polyphony, the earlier melo-rhythmic refinements of monophonic chant seem to fall into disuse. Later redactions such as the Editio medicaea of 1614 rewrote chant so that melismata, with their melodic accent, fell on accented syllables. This aesthetic held sway until the re-examination of chant in the late 19th century by such scholars as Wagner, Pothier, and Mocquereau, who fell into two camps. Dom Eugene Cardine, (1905–1988) monk from Solesmes, published his 'Semiologie Gregorienne' in 1970 in which he clearly explains the musical significance of the neumes of the early chant manuscripts. Cardine shows the great diversity of neumes and graphic variations of the basic shape of a particular neume, which can not be expressed in the square notation. This variety in notation must have served a practical purpose and therefore a musical significance. Nine years later, the Graduale Triplex was published, in which the Roman Gradual, containing all the chants for Mass in a Year's cycle, appeared with the neumes of the two most important manuscripts copied under and over the 4-line staff of the square notation. The Graduale Triplex made widely accessible the original notation of Sankt Gallen and Laon (compiled after 930 AD) in a single chantbook and was a huge step forward. Dom Cardine had many students who have each in their own way continued their semiological studies, some of whom also started experimenting in applying the newly understood principles in performance practice. The studies of Cardine and his students (Godehard Joppich, Luigi Augustoni, Johannes B. Göschl, Marie-Noël Colette, Rupert Fischer, Marie-Claire Billecocq, Alexander M. Schweitzer to name a few) have clearly demonstrated that rhythm in Gregorian chant as notated in the 10th century rhythmic manuscripts (notably Skt. Gallen and Laon) manifest such rhythmic diversity and melodic – rhythmic ornamentations for which there is hardly a living performance tradition in the Western world. Contemporary groups that endeavour to sing according to the manuscript traditions have evolved after 1975. Some practising researchers favour a closer look at non Western (liturgical) traditions, in such cultures where the tradition of modal monophony was never abandoned. Another group with different views are the mensuralists or the proportionalists, who maintain that rhythm has to be interpreted proportionately, where shorts are exactly half the longs. This school of interpretation claims the support of historical authorities such as St Augustine, Remigius, Guido and Aribo. This view is advocated by John Blackley and his 'Schola Antiqua New York'. Recent research in the Netherlands by Dr. Dirk van Kampen has indicated that the authentic rhythm of Gregorian chant in the 10th century includes both proportional elements and elements that are in agreement with semiology. Starting with the expectation that the rhythm of Gregorian chant (and thus the duration of the individual notes) anyway adds to the expressivity of the sacred Latin texts, several word-related variables were studied for their relationship with several neume-related variables, exploring these relationships in a sample of introit chants using such statistical methods as correlational analysis and multiple regression analysis. Beside the length of the syllables (measured in tenths of seconds), each text syllable was evaluated in terms of its position within the word to which it belongs, defining such variables as "the syllable has or has not the main accent", "the syllable is or is not at the end of a word", etc., and in terms of the particular sounds produced (for instance, the syllable contains the vowel "i"). The various neume elements were evaluated by attaching different duration values to them, both in terms of semiological propositions (nuanced durations according to the manner of neume writing in Chris Hakkennes’ Graduale Lagal), and in terms of fixed duration values that were based on mensuralistic notions, however with ratios between short and long notes ranging from 1 : 1, via 1 : 1.2, 1 : 1.4, etc. to 1 : 3. To distinguish short and long notes, tables were consulted that were established by Van Kampen in an unpublished comparative study regarding the neume notations according to St Gallen and Laon codices. With some exceptions, these tables confirm the short vs. long distinctions in Cardine’s 'Semiologie Gregorienne'. The lengths of the neumes were given values by adding up the duration values for the separate neume elements, each time following a particular hypothesis concerning the rhythm of Gregoriant chant. Both the syllable lengths and the neume lengths were also expressed in relation to the total duration of the syllables, resp. neumes for a word (contextual variables). Correlating the various word and neume variables, substantial correlations were found for the word variables 'accented syllable' and 'contextual syllable duration'. Moreover, it could be established that the multiple correlation (R) between the two types of variables reaches its maximum (R is about 0.80) if the neumatic elements are evaluated according to the following rules of duration: (a) neume elements that represent short notes in neumes consisting of at least two notes have duration values of 1 time; (b) neume elements that represent long notes in neumes consisting of at least two notes have duration values of 2 times; (c) neumes consisting of only one note are characterized by flexible duration values (with an average value of 2 times), which take over the duration values of the syllables to match. The distinction between the first two rules and the latter rule can also be found in early treatises on music, introducing the terms metrum and rhythmus. As it could also be demonstrated by Van Kampen that melodic peaks often coincide with the word accent (see also), the conclusion seems warranted that the Gregorian melodies enhance the expressiveness of the Latin words by mimicking to some extent both the accentuation of the sacred words (pitch differences between neumes) and the relative duration of the word syllables (by paying attention to well-defined length differences between the individual notes of a neume). During the seventeenth through nineteenth centuries in France, the system of rhythmic notation became standardized, with printers and editors of chant books employing only four rhythmic values. Recent research by Christopher Holman indicates that chants whose texts are in a regular meter could even be altered to be performed in Time signatures. Recent developments involve an intensifying of the semiological approach according to Dom Cardine, which also gave a new impetus to the research into melodic variants in various manuscripts of chant. 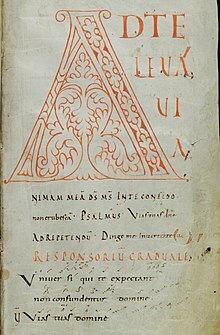 On the basis of this ongoing research it has become obvious that the Graduale and other chantbooks contain many melodic errors, some very consistently, (the mis-interpretation of third and eighth mode) necessitating a new edition of the Graduale according to state-of-the-art melodic restitutions. Since the 1970 a melodic restitution group of AISCGre (International Society for the Study of Gregorian Chant) has worked on an "editio magis critica" as requested by the 2. Vatican Council Constitution "Sacrosanctum Concilium". As a response to this need and following the Holy See's invitation to edit a more critical edition, in 2011 the first volume "De Dominicis et Festis" of the "Graduale Novum Editio Magis Critica Iuxta SC 117"was published by Libreria Editrice Vatican and ConBrio Verlagsgesellschaft, Regensburg. In this approach the so-called earlier 'rhythmic' manuscripts of unheightened neumes that carry a wealth of melo-rhythmic information but not of exact pitches, are compared in large tables of comparison with relevant later 'melodic' manuscripts' that are written on lines or use double alphabetic and neumes notation over the text, but as a rule have less rhythmic refinement compared to the earlier group. However, the comparison between the two groups has made it possible to correct what are obvious mistakes. In other instances it is not so easy to find a consensus. In 1984 Chris Hakkennes published his own transcription of the Graduale Triplex. He devised a new graphic adaptation of square notation 'simplex' in which he integrated the rhythmic indications of the two most relevant sources, that of Laon and Skt. Gallen. Referring to these manuscripts, he called his own transcription Gradual Lagal. Furthermore, while making the transcription, he cross-checked with the melodic manuscripts to correct modal errors or other melodic errors found in the Graduale Romanum. His intention was to provide a corrected melody in rhythmic notation but above all – he was also a choirmaster – suited for practical use, therefore a simplex, integrated notation. Although fully admitting the importance of Hakkennes' melodic revisions, the rhythmical solution suggested in the Graduale Lagal was actually found by Van Kampen (see above) to be rather modestly related to the text of the chant. Gregorian chant is sung in the Office during the canonical hours and in the liturgy of the Mass. Texts known as accentus are intoned by bishops, priests, and deacons, mostly on a single reciting tone with simple melodic formulae at certain places in each sentence. More complex chants are sung by trained soloists and choirs. The Graduale Romanum contains the proper chants of the Mass (i.e., Introit, Gradual, Alleluia, Tract, Offertory, Communion) and the complete Kyriale (the collection of Mass Ordinary settings). The Liber usualis contains the chants for the Graduale Romanum and the most commonly used Office chants. The Introit, Gradual, Alleluia, Tract, Sequence, Offertory and Communion chants are part of the Proper of the Mass. "Proprium Missae" in Latin refers to the chants of the Mass that have their proper individual texts for each Sunday throughout the annual cycle, as opposed to 'Ordinarium Missae' which have fixed texts (but various melodies) (Kyrie, Sanctus, Benedictus, Agnus Dei). Graduals are responsorial chants that follow the reading of the Epistle. Graduals usually result from centonization; stock musical phrases are assembled like a patchwork to create the full melody of the chant, creating families of musically related melodies. Graduals are accompanied by an elaborate Verse, so that it actually consists in two different parts, A B. Often the first part is sung again, creating a 'rondeau' A B A. At least the verse, if not the complete gradual, is for the solo cantor and are in elaborate, ornate style with long, wide-ranged melismata. The Alleluia is known for the jubilus, an extended joyful melisma on the last vowel of 'Alleluia'. The Alleluia is also in two parts, the alleluia proper and the psalmverse, by which the Alleluia is identified (Alleluia V. Pascha nostrum). The last melisma of the verse is the same as the jubilus attached to the Alleluia. Alleluias are not sung during penitential times, such as Lent. Instead, a Tract is chanted, usually with texts from the Psalms. Tracts, like Graduals, are highly centonized. Sequences are sung poems based on couplets. Although many sequences are not part of the liturgy and thus not part of the Gregorian repertory proper, Gregorian sequences include such well-known chants as Victimae paschali laudes and Veni Sancte Spiritus. According to Notker Balbulus, an early sequence writer, their origins lie in the addition of words to the long melismata of the jubilus of Alleluia chants. Offertories are sung during the offering of Eucharistic bread and wine. Offertories once had highly prolix melodies in their verses, but the use of verses in Gregorian Offertories disappeared around the 12th century. These verses however, are among the most ornate and elaborated in the whole chant repertoire. Offertories are in form closest to Responsories, which are likewise accompanied by at least one Verse and the opening sections of both Off. and Resp. are partly repeated after the verse(s). This last section is therefore called the 'repetenda' and is in performance the last melodic line of the chant. The Kyrie, Gloria, Credo, Sanctus, Benedictus and Agnus Dei use the same text in every service of the Mass. Because they follow the regular invariable "order" of the Mass, these chants are called "Ordinary". Plainchant notation for the solemn setting of the Salve Regina; a simple setting is used more commonly. At the close of the Office, one of four Marian antiphons is sung. These songs, Alma Redemptoris Mater (see top of article), Ave Regina caelorum, Regina caeli laetare, and Salve, Regina, are relatively late chants, dating to the 11th century, and considerably more complex than most Office antiphons. Willi Apel has described these four songs as "among the most beautiful creations of the late Middle Ages." The renewed interest in early music in the late 19th century left its mark on 20th-century music. Gregorian influences in classical music include the choral setting of four chants in Quatre Motets sur des thèmes grégoriens by Maurice Duruflé, the carols of Peter Maxwell Davies, and the choral work of Arvo Pärt. Gregorian chant is vaguely imitated into other genres, such as London Boys' Requiem and some other dance compositions, Enigma's Sadeness (Part I), the chant interpretation of pop and rock by the German band Gregorian, the new-age project Era, the techno project E Nomine, many of the songs by American power/thrash metal band Iced Earth, and the work of black metal band Deathspell Omega. The modal melodies of chant provide unusual sounds to ears attuned to modern scales. It has also been used in The Omen's main theme, Ave Satani. The monks of Solesmes, discussed above for their revival of Gregorian chant, issued a number of recordings. However, when Gregorian chant as plainchant experienced a popular resurgence during the new-age and world-music movements of the 1980s and '90s, the iconic album was somewhat unexpectedly Chant, recorded by the Benedictine monks of Santo Domingo de Silos, Spain. This was marketed as music to inspire timeless calm and serenity. In 2008, the Cistercian Monks of Austrian Heiligenkreuz Abbey released the CD Chant – Music for Paradise, which became the best-selling album of the Austrian pop charts and peaked #7 of the UK charts. In the US, the album was released under the title Chant – Music for the Soul and peaked at #4 on the Billboard classical charts. It became conventional wisdom that listening to Gregorian chant increased the production of alpha waves in the brain, reinforcing the popular reputation of Gregorian chant as tranquilizing music. Gregorian chant has often been parodied for its supposed monotony, both before and after the release of Chant. Famous references include the flagellant monks in Monty Python and the Holy Grail intoning "Pie Jesu Domine dona eis requiem" (Good Lord Jesus, grant them rest). "The Gregorian Chant" was the title of a British television play in the 60's starring Billie Whitelaw as a prostitute with unexpectedly refined tastes. Gregorian chant has been also used in Vision of Escaflowne and Death Note anime series, Disney's The Hunchback of Notre Dame, the theme of the Temple of Time in the Legend of Zelda series and the Halo series of videogames, although it had been used in such a number of productions and movies that this is only a very selective list of examples. ^ Apel, Gregorian Chant p. 34. ^ a b Bewerunge, Heinrich (1913). "Gregorian chant" . In Herbermann, Charles (ed.). Catholic Encyclopedia. New York: Robert Appleton Company. ^ Kenneth, Levy; et al. "Plainchant, §2: History to the 10th century". Grove Music Online. Oxford University Press. ^ Grier J. (2003) Ademar de Chabannes, Carolingian Musical Practices, and Nota Romana. Journal of the American Musicological Society. 56 (1):43–98. ^ Hoppin, Medieval Music p. 47. ^ "Paléographie musicale : fac-similés phototypiques des principaux manuscrits de chant grégorien, ambrosien, mozarabe, gallican". Internet Archive. ^ "The symbolism of chant rhythm". Calumcille.com. Archived from the original on 15 March 2012. Retrieved 6 June 2012. ^ Dirk van Kampen (1994). Het oorspronkelijke ritme van het Gregoriaans: Een 'semiologisch-mensuralistische' studie. Landsmeer, ISBN 90-900742-8-7. ^ Dirk van Kampen (2005). Uitgangspunten voor de ritmiek van Gregoriaans. Tijdschrift voor Gregoriaans, 30, 89–94. ^ Chris Hakkennes (1984). Graduale Lagal. Den Haag: Stichting Centrum voor de Kerkzang. ^ Peter Wagner (1916). Zur ursprünglichen Ausführung des Gregorianischen Gesanges. Gregoriusblatt, 81–82. ^ J. Jeannin (1930). Proportionale Dauerwerte oder einfache Schattierungen im Gregorianischen Choral? Gregoriusblatt, 54, 129–135. ^ G. Reese (1940). Music in the Middle Ages. New York: Norton & Comp., p. 166. ^ Holman, Christopher (November 2017). "Rhythm and metre in French Classical plainchant". Early Music. 45, vol. 4: 657–664. ^ Apel, Gregorian Chant p. 404. ^ "Cistercian Monks of Stift Heiligenkreuz". Chart History. Billboard. Retrieved 22 June 2013. ^ Universal news. [dead link] Retrieved 24 April 2009. Apel, Willi (1990). Gregorian Chant. Bloomington, Indiana: Indiana University Press. ISBN��0-253-20601-4. Bewerunge, H. (1913). "Gregorian Chant" . In Herbermann, Charles (ed.). Catholic Encyclopedia. New York: Robert Appleton Company. Ian D. Bent; David W. Hughes; Robert C. Provine; Richard Rastall; Anne Kilmer; David Hiley; Janka Szendrei; Thomas B. Payne; Margaret Bent; Geoffrey Chew. L. Macy (ed.). Notation. Grove Music Online. Dyer, Joseph. "Roman Catholic Church Music". Grove Music Online, ed. L. Macy. pp. Section VI.1. Retrieved 28 June 2006. Grout, Donald (1960). A History of Western Music. New York: W. W. Norton & Co. ISBN 0-393-09537-1. Hiley, David (1990). "Chant". In Brown, Howard Mayer; Sadie, Stanley (eds.). Performance Practice: Music before 1600. New York: W.W. Norton & Company. pp. 37–54. ISBN 0-393-02807-0. Levy, Kenneth. "Plainchant". Grove Music Online, ed. L. Macy. pp. Section VI.1. Retrieved 20 January 2006. Mahrt, William P. "Gregorian Chant as a Paradigm of Sacred Music". Sacred Music. 133 (3): 5–14. Mahrt, William P. (2000). "Chant". In Duffin, Ross (ed.). A Performer's Guide to Medieval Music. Bloomington, Indiana: Indiana University Press. pp. 1–22. ISBN 0-253-33752-6. McKinnon, James W. "Christian Church, music of the early". Grove Music Online, ed. L. Macy. Retrieved 11 July 2006. Wagner, Peter (1911). Einführung in die Gregorianischen Melodien. Ein Handbuch der Choralwissenschaft (in German). Leipzig: Breitkopf & Härtel. Ward, Justine Bayard (April 1906). "The Reform in Church Music". The Atlantic Monthly. 97: 455–463. Reprint at MusicaSacra.com website (accessed 20 January 2014). Wikimedia Commons has media related to Gregorian chant.